To my knowledge, in “Street Haunting” V. Woolf doesnt make explicit the distinction between “street rambling,” which she uses at the beginning of the piece, and “street haunting” which comes at the end. Presumably “haunting” is when the consciousness flits from person to person, to briefly inhabit their life and point of view, to momentarily ramble the street in their boots. Dickens is another English master who pounded the pavement at night, and his own essay “Night Walks” has plenty of rambling and also ghosts. Dickens brings the social consciousness that we’d expect. 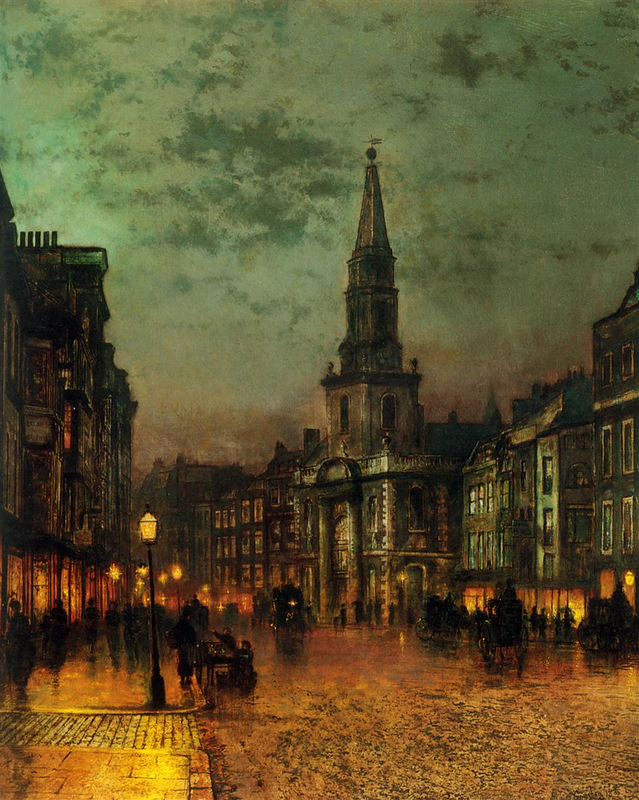 Like Woolf’s Georgian London, CD’s Victorian London is sparsely populated by nocturnal indigents. Woolf’s narrator just takes these poor people in as they sleep on steps, refusing to reflect on class difference, so that the impression comes that these spectacles are just so, available for her upper bourgeois consumption (what with her talk about fox-hunting and golf and all). It shivered from head to foot, and its teeth chattered, and as it stared at me — persecutor, devil, ghost, whatever it thought me — it made with its whining mouth as if it were snapping at me, like a worried dog. Intending to give this ugly object money, I put out my hand to stay it — for it recoiled as it whined and snapped — and laid my hand upon its shoulder. Instantly, it twisted out of its garment, like the young man in the New Testament, and left me standing alone with its rags in my hands. Neither of these writers were interested in revolutionary solutions to poverty — but it’s funny that Dickens with all his middle class sympathy for the proletariate in his novels turns the poor into objects constructed by his masterful prose; and on the other hand, Woolf, for all her snobbery, gives them a little more autonomy and dignity from her distanced narration and experiments in point of view. When a church clock strikes, on houseless ears in the dead of the night, it may be at first mistaken for company and hailed as such. But, as the spreading circles of vibration, which you may perceive at such a time with great clearness, go opening out, for ever and ever afterwards widening perhaps (as the philosopher has suggested) in eternal space, the mistake is rectified and the sense of loneliness is profounder. But one of the worst night sights I know in London, is to be found in the children who prowl about this place; who sleep in the baskets, fight for the offal, dart at any object they think they can lay their thieving hands on, dive under the carts and barrows, dodge the constables, and are perpetually making a blunt pattering on the pavement of the Piazza with the rain of their naked feet. It’s dominated by verbs, and they have a fun alliteration while hinting at an entire way of life; the only adjectives are “thieving” which is severe but the judgement is softened to me by the surrounding words, and “blunt” pattering, an inspired description. And the clincher of the whole sentence is a nice metaphor which reminds us that it is raining in this scene and divulges the wrenching final detail that these kids have no shoes. The piece is a pretty straight-ahead, one scene for one paragraph kind of read. But at the level of word and sentence the craft is top-notch. These long sentences dont state a claim and elaborate, the way i see a lot of nonfiction work, and certainly the way i was trained to write papers in college — they climb up and up to the final insight or crucial detail. If you scan over them too quickly, as i sometimes feel like we are encouraged to read these days, these mortar shot sentences phase past you like spectral beings. And to the narrator just about every one is like a ghost in these scenes, even a very corporeal man who eats a meat pudding by hand in a coffee house — a goofy “Dickensian” character, pretty rare in this essay, actually. To walk on to the Bank, lamenting the good old times and bemoaning the present evil period, would be an easy next step, so I would take it, and would make my houseless circuit of the Bank, and give a thought to the treasure within; likewise to the guard of soldiers passing the night there, and nodding over the fire. Next, I went to Billingsgate, in some hope of market-people, but it proving as yet too early, crossed London-bridge and got down by the waterside on the Surrey shore among the buildings of the great brewery. There was plenty going on at the brewery; and the reek, and the smell of grains, and the rattling of the plump dray horses at their mangers, were capital company. Quite refreshed by having mingled with this good society, I made a new start with a new heart, setting the old King’s Bench prison before me for my next object, and resolving, when I should come to the wall, to think of poor Horace Kinch, and the Dry Rot in men. A very curious disease the Dry Rot in men, and difficult to detect the beginning of. It had carried Horace Kinch inside the wall of the old King’s Bench prison, and it had carried him out with his feet foremost. He was a likely man to look at, in the prime of life, well to do, as clever as he needed to be, and popular among many friends. He was suitably married, and had healthy and pretty children. But, like some fair-looking houses or fair-looking ships, he took the Dry Rot. The first strong external revelation of the Dry Rot in men, is a tendency to lurk and lounge; to be at street-corners without intelligible reason; to be going anywhere when met; to be about many places rather than at any; to do nothing tangible, but to have an intention of performing a variety of intangible duties to-morrow or the day after. When this manifestation of the disease is observed, the observer will usually connect it with a vague impression once formed or received, that the patient was living a little too hard. He will scarcely have had leisure to turn it over in his mind and form the terrible suspicion “Dry Rot,” when he will notice a change for the worse in the patient’s appearance: a certain slovenliness and deterioration, which is not poverty, nor dirt, nor intoxication, nor ill-health, but simply Dry Rot. To this, succeeds a smell as of strong waters, in the morning; to that, a looseness respecting money; to that, a stronger smell as of strong waters, at all times; to that, a looseness respecting everything; to that, a trembling of the limbs, somnolency, misery, and crumbling to pieces. As it is in wood, so it is in men. Dry Rot advances at a compound usury quite incalculable. A plank is found infected with it, and the whole structure is devoted. Thus it had been with the unhappy Horace Kinch, lately buried by a small subscription. Those who knew him had not nigh done saying, “So well off, so comfortably established, with such hope before him — and yet, it is feared, with a slight touch of Dry Rot!” when lo! the man was all Dry Rot and dust. From the dead wall associated on those houseless nights with this too common story, I chose next to wander by Bethlehem Hospital; partly, because it lay on my road round to Westminster; partly, because I had a night fancy in my head which could be best pursued within sight of its walls and dome. And the fancy was this: Are not the sane and the insane equal at night as the sane lie a dreaming? Are not all of us outside this hospital, who dream, more or less in the condition of those inside it, every night of our lives? Are we not nightly persuaded, as they daily are, that we associate preposterously with kings and queens, emperors and empresses, and notabilities of all sorts? Do we not nightly jumble events and personages and times and places, as these do daily? Are we not sometimes troubled by our own sleeping inconsistencies, and do we not vexedly try to account for them or excuse them, just as these do sometimes in respect of their waking delusions? Said an afflicted man to me, when I was last in a hospital like this, “Sir, I can frequently fly.” I was half ashamed to reflect that so could I — by night. Said a woman to me on the same occasion, “Queen Victoria frequently comes to dine with me, and her Majesty and I dine off peaches and maccaroni in our nightgowns, and his Royal Highness the Prince Consort does us the honour to make a third on horseback in a Field-Marshal’s uniform.” Could I refrain from reddening with consciousness when I remembered the amazing royal parties I myself had given (at night), the unaccountable viands I had put on table, and my extraordinary manner of conducting myself on those distinguished occasions? I wonder that the great master who knew everything, when he called Sleep the death of each day’s life, did not call Dreams the insanity of each day’s sanity.